All the rage on the 6th of December 2017 was the market news that Steinhoff (SNH) Marcus Jooste resigned overnight. This is due to accounting irregularities which lead to Steinhoff not publishing their results on the expected date. Known as a dealmaker and bit of a cowboy, it seems this one has finally been thrown off his horse. Question is will he be thrown in jail ? As has become the new norm with Steinhoff, they seem to update shareholders with crumbs of information often, so that it looks like they engaging shareholders but essentially they are not saying much. Below the latest in the scandal as provided by Steinhoff. "The Company is providing the following update further to its announcement dated 5 December 2017 and its ongoing investigations into past financial years. This update is made on the basis of the information that has been made available and analysed to date. The Company, on the advice of the independent committee of the Supervisory Board, has today formed the view that issues concerning the validity and recoverability of certain Steinhoff Europe balance sheet assets under scrutiny in the 2017 audit work, are also relevant to the 2016 consolidated financial statements. Therefore, the Company announces that, based on section 2:362 (6) of the Dutch Civil Code, the 2016 consolidated financial statements will need to be restated and can no longer be relied upon. The Company, on the advice of the independent committee of the Supervisory Board, together with their advisers, is taking all necessary steps to address the audit issues and will keep the market informed of any material developments. Still no real details as to what exactly went wrong, who knew about it and for how long it was known and why it was kept quiet. While Steinhoff is providing regular updates, they dont really mean much. We suspect it is a case of a dear caught in the headlights, or that of an ostrich just sticking its head in the sand. So while the buzz around Steinhoff's cowboy tricks have died down a bit, there is still a lot of rumours doing the rounds as the news and updates released by Steinhoff is hardly enough to put an end to all the rumours and gossip doing the rounds as to exactly what happenend and how, and what the true magnitude and extent of it all is. On the 11th December 2017 Steinhoff released the following statement. Appointment of an International Advisory Team The Group announces that Moelis & Company ("Moelis") and AlixPartners have been appointed as independent financial advisor and operational advisor respectively with immediate effect. Moelis will support and advise on the Group’s discussions with its lenders, while AlixPartners will assist on liquidity management and operational measures. The Group is currently fully focussed on safeguarding operational liquidity to continue funding existing operations throughout its various subsidiaries. In this context, the Group is asking for and requires continued support in relation to existing facilities from all its lenders to achieve an immediate stabilisation of the Group’s financing. Lender Meeting The purpose of the meeting will be for the Group to provide an update on its ongoing operational and financial situation. An agenda for the meeting will be circulated ahead of 19 December 2017. Shareholders and other investors in the company are advised to exercise caution when dealing in the securities of the group." and Trading in the underlying businesses across the globe continues uninterrupted particularly in the pre-Christmas period. Steinhoff is a global group with 130 000 employees in its underlying operations comprising approximately 12 000 retail outlets in 30 countries with many successful underlying operations. " 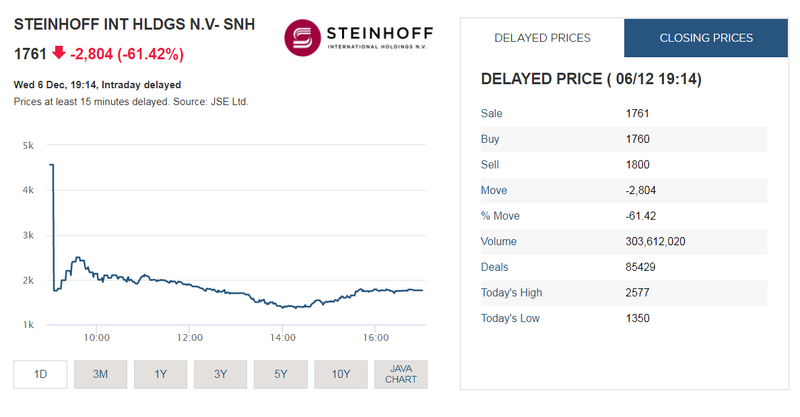 What is also interesting to note is the fact that while the heavy selling of SNH's shares have died down and it has strenghtened significantly off its lows reached, the same cannot be said about deemed "related" parties to Steinhoff. The image below shows the share price return from Friday 8 December 2017 to closing prices ion Tuesday 12 December 2017. For the full interactive graphic see the graphic under the 8 December 2017 update. The graphic belows shows the share price performance over the last two years for Steinhoff International (SNH), Steinhoff Retail (SRR), PSG Group and KAP. While the financial irregularities at Steinhoff International was reported by them, market participants are afraid that there will be some contamination of Steinhoff related or Steinhoff connected companies. The chart below shows the share price performance of thee companies mentioned above and as the graph shows all the other companies mentioned have experienced share price declines too in recent days, though not anything as severe as that experienced by Steinhoff International. For those not comfortable playing with the interactive chart above, the two images below shows the shares mentioned above'share price performance for the month of December 2017 so far, as well as the share price performance over the last 30 days. Steinhoff International share price has declined by 82.9% over the last month, with Steinhoff Retail's share price declining by just under 30%, PSG group still showing a small increase of just over 3% (though big share price declines can be seen in PSG over the last couple of days) and KAP's share price is down almost 7% over the last month. Below another announcement by Steinhoff regarding the financial irregularities. Seems they estimating an amount of roughly Euro 6 billion. or for South African's R96billion. Now the question is how on earth did their own bookkeepers and their auditors not pick up on this sizable hole in their books? Did they know and just turn a blind eye? hareholders are referred to the AD HOC announcement released on 5 December 2017 in which the Company advised the market that the Company’s audited results will be delayed pending further investigation. The Supervisory Board has today given further consideration to the issues subject to the investigation and to the validity and recoverability of certain non-South African assets of the Company which amount to circa €6bn. The Company wishes to provide additional comfort on the Company’s liquidity. In this regard, the Company has today received expressions of interest in certain non-core assets that will release a minimum of €1bn of liquidity. In addition, the Company’s subsidiary Steinhoff Africa Retail Limited (STAR) will today formally commit to the refinancing of its long-term liabilities due to the company. It is expected that the STAR refinancing will be concluded on better terms than those applicable to STAR’s current liabilities due to Steinhoff, given the strong cash flow inherent in its business. The additional liquidity of circa €2bn expected to be achieved through these measures will strengthen the Company’s balance sheet and should provide additional comfort to stakeholders of the Company’s ability to be able to fund its existing operations and reduce debt. Furthermore, based on the current information at the Board’ disposal there is no evidence to suggest that the CFO had any involvement in the matters under investigation. Therefore, the Company wishes to confirm that its CFO, Ben La Grange, remains in his position. Ben La Grange has resigned from his position as CEO of STAR in order to focus solely on his role as CFO of the Company at this time. Below is the official statement from Steinhof regarding the accounting irregularities. he Supervisory Board of Steinhoff wishes to advise shareholders that new information has come to light today which relates to accounting irregularities requiring further investigation. The Supervisory Board, in consultation with the statutory auditors of the Company, has approached PWC to perform an independent investigation. Markus Jooste, CEO of Steinhoff has today tendered his resignation with immediate effect and the Board has accepted the resignation. Steinhoff will update the market as the aforesaid investigation proceeds. The Company will publish the audited 2017 consolidated financial statements when it is in a position to do so. In addition, the Company will determine whether any prior years’ financial statements will need to be restated. "Hi there,Firstly I would like to apologise for all the bad publicity I caused the Steinhoff company the last couple of months. It is time for me to move on and take the consequences of my behavior like a man. Sorry that I have disappointed all of you and I never meant to cause any of you any harm. Please continue to live the Steinhoff dream and I must make it very clear none of Danie [van der Merwe – COO], Ben [la Grange – CFO], Stehan [Grobler – executive Group Treasury and Financing] and Mariza [Nel] – Corporate Services, IT & HR] had anything to do with any of my mistakes. The link to the letter on moneyweb can be found here. Those words wont help sooth investors and pensioners anger and frustration at the fact that the SNH shares they are heavily invested in either directly or via pension funds etc plummeted down at the same speed a Peregrine eagle would reach when bearing down in prey. 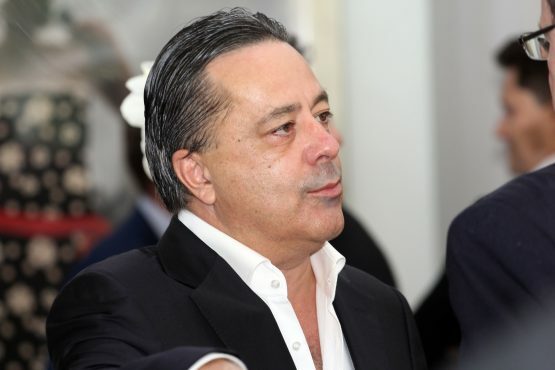 Fund managers and investors it seems were deliberately deceived by Steinhoff with some rumours doing the rounds that earnings were overstated by billions of Rands in which related party transactions were never flagged as such in their accounting. So it was a bloodbath then? The big question is what exactly are these irregularities, how long has it been going on, and who actually knew about it. If the directors and CEO knew about it and kept quiet they are complicit in possible fraud and should be charged and dealt with accordingly. This has the makings of being and it probably already is the biggest financial scandal to hit South African markets, African Bank being the other, but their size fails in comparison to the size of the SNH business and the value that has been wiped off the market and investors portfolio's and pension funds' pensions and regular run of the mill investors unit trusts. We suspect part of the massive decline in the share price is due to various long contracts on SNH, being squeezed and having to be liquidated to avoid margin calls. This can take days or even weeks to unwind, as fund managers and the likes will likely be all to keen to get rid of SNH shares so they dont have to explain to shareholders and investors in a few months why they still hold shares in SNH. As an aside during the day Steinhoff shares plummeted it wiped out R117billion in value for investors of all shapes and sizes. That is a massive amount of value that disappeared during the course of today. We suspect Christmas will not be a very joyful one in the scenic town of Stellenbosch this year. Performance of related or linked companies during the day?